As part of our discussion on new ASP.NET 2.0 features, we now discuss new server control Bulleted List. In our efforts to display organized data which makes sense to reader, we make use of different server controls in ASP.NET 2.0 to render organized data. 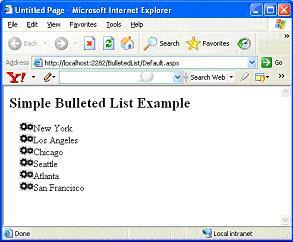 Similarly, Bulleted List control also helps in displaying collection of items in a bulleted list. 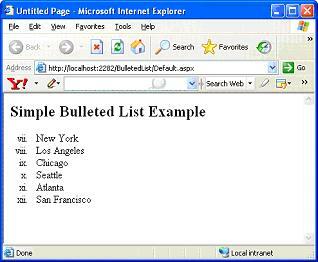 The Bulleted List server control is meant to display a bulleted list of items easily in an ordered or unordered fashion. To specify the individual list items in the list, you put a ListItem control for each list entry between the opening and closing tags of the Bulleted List control as shown in code listing below. You can download sample web project, used in this tutorial. In below output, you can observe the new style which I have used to list the items by setting BulletStyle attribute. DisplayMode Text allows displaying items in Bulleted List as static text. DisplayMode Hyperlink allows rendering each Bulleted List item as Hyperlink. We can redirect to another page by clicking the link. This is possible by setting by <asp:ListItem> Value attribute. In above example, the DisplayMode attribute is set to LinkButton and the OnClick attribute is used to point to the BulletedList4_Click event. 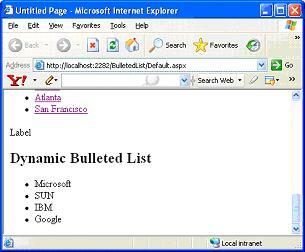 BulletedList4_Click uses the BulletedListEventArgs object, which only exposes the Index property. Using that, you can determine the index number of the item selected. Similarly, you can directly access the Text value of a selected item by using the Items property. Now that you have seen how to create bulleted lists with items that you declaratively place in the code, take a look at how to create dynamic bulleted lists from items that are stored in a data store. 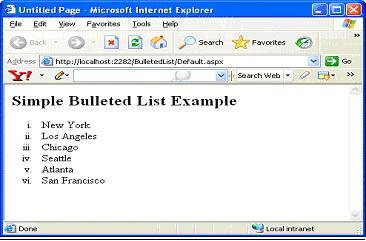 The following example shows how to use the Bulleted List control to data-bind to results coming from a data store; in it, all information is retrieved from an XML file. The first step is to create Companies.xml as shown below. 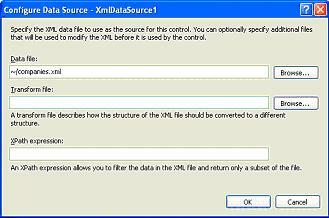 To populate the Bulleted List server control with the Name attribute from the Companies.xml file, use an XmlDataSource control to access the file, as shown below. 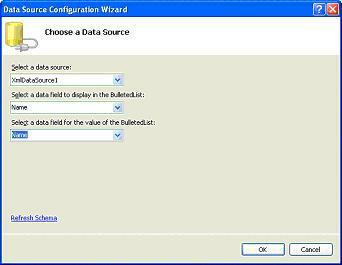 Configure XmlDatasource for the Bulleted list by chosing Show Smart Tag option from context menu. From Show Smart Tag window, click Configure Data Source option. You can see following window. Click Browse button to add Data file as shown below. Above output says it all, Bulleted List control pulled all Name attribute values from the xml file.